Sometimes the most industrious businesses don't just stick to what they know - they expand to capture additional markets and ensure that their appeal reaches a greater scope of clientele. The most recent example of creative branding has occurred with the popular fashion brand Ed Hardy. Keep on reading to find out what they've done to re-invent themselves! Ed Hardy, most recently known for appearing on slacker dad and womanizer Jon Gosselin (of TLC's Jon & Kate Plus 8 fame). Despite the fact that this has been a big part of the clothing brand's most recent publicity (sadly), the Ed Hardy Company is expanding to market a product that is currently highly in demand. 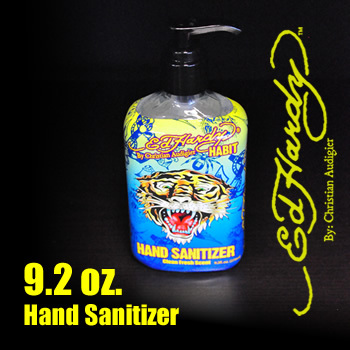 The most recent addition to the Ed Hardy line has nothing to do with clothing; it's a designer line of hand sanitizers which allows the brand to market themselves towards the growing concern surrounding the approaching flu season and the H1N1 virus. 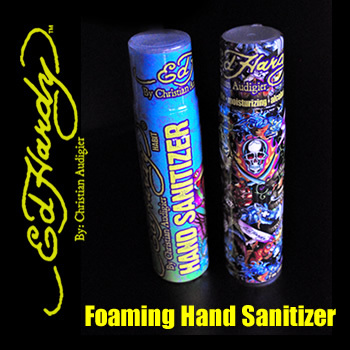 The cleansing products are available in two different sized bottles, a foaming stick, or pens that dispense the sanitizing gel. Each have a unique design, inspired by tattoo art that Ed Hardy is known for, and they do come with a designer price tag at $3 to $13 per bottle, so they're best suited for the health conscious with money to burn! Ed Hardy is a great example of branding that can expand their market and appeal; a necessary move in a time of economic uncertainty. 8 Strange Glasses & Goggles To Wear On The Funniest Day Of The Year; April Fools!